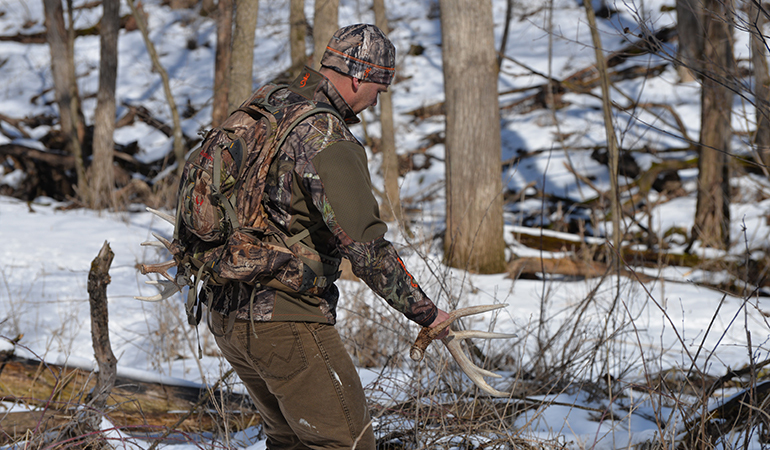 Shed hunting in all of its glory as of late, is similar to actual deer hunting in a few ways. Participation on parcels that are open to the public is high in both activities, and most of us who tread that ground follow predictable strategies. For example, if you’ve got a chunk of open-to-all ground with an agricultural field or two on it, you can pretty much guess where most of the hunting pressure will be concentrated. Ditto for shed hunters. The key to being successful in either endeavor is to plan to outthink - and outwork - your competition. Whether I’m on a piece of private ground or shed hunting public, I tend to start the day with a rough plan. This usually involves a bit of mapwork via onX or some other service, and just allows me to look at likely antler spots and be as efficient in my walking as possible. It also allows me to check out all access sites on any given parcel and plan around where the other shed hunters are most likely to originate from, and where they’ll end up once they get going. I also like to record my tracks when I’m shed hunting so at the end of the day I can see where I walked, and more importantly, where I didn’t. We tend to believe we cover some serious mileage when we’re in the woods, but oftentimes we don’t travel as far as we think. And almost without question, we miss good spots. At the end of a shed hunting day when you look back at all of the field edges, fence crossings and bedding ridges you traversed, think about all of the places you didn’t go. Even on a small parcel it takes Terminator-like dedication to cover every acre adequately. 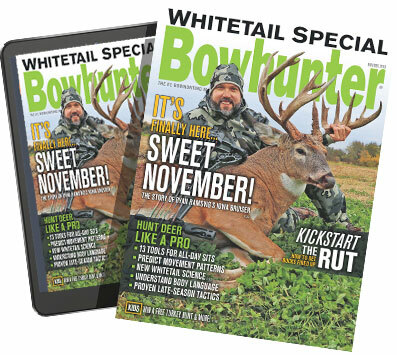 Plan your routes, track your routes, and go where others don’t when you’re shed hunting to find more bone on pressured dirt. I’ll never forget a few years ago while shed hunting with a buddy of mine when he whooped it up over finding a beautiful five-point side. We figured the match must be close and started scouring the snow-covered woods nearby. We gave up once, only to talk ourselves into walking the patch again. It wasn’t until we’d invested serious time in our grid search that I spotted a row of tines periscoping out of the powder, and we matched up the set. We had walked within a few yards of that antler multiple times and missed it every time. 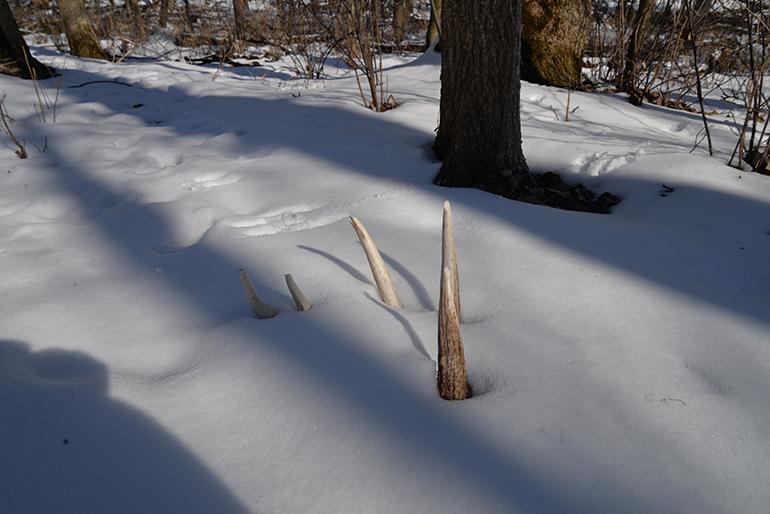 If shed hunting pressure is intense in your spots, remember this: you only need to be 10 yards off of where the rest of the hunters go to succeed where they failed. While it’s tempting to try to be the first one in the shed woods each season so you can post selfies with your early finds, the bulk of the antler drop probably won’t happen in your neck of the woods until at least mid-February, perhaps much later if you live down south. This means that while some antlers are scooped up early, a lot of them are still riding around on bucks’ foreheads. 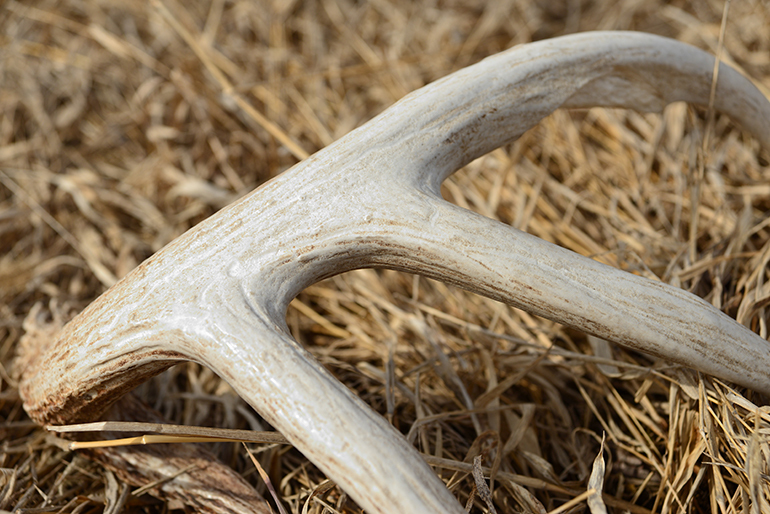 Time your shed hunts when you’ve got the best chance of running into the most antlers. And remember, even if you didn’t find any bone today in your best spots, that doesn’t mean three days from now there won’t be an antler with a bloody pedicle waiting for you. Two instances where I carry binoculars that I never thought I would are when I’m blood trailing any critter and when I’m shed hunting. Last March I was walking through a snow-patched alfalfa field and spotted what looked like a single tine poking out of a depression. It was 50 yards away and with the naked eye just looked a little out of place. With my binos, however, I could see not only that tine but another one. Good glass is a shed hunter’s friend, so carry your binos and use them to be more efficient in the woods this spring. It was the second biggest shed of my 2018 season and barely visible, due to where it fell. I’d say that maybe 25 percent of the antlers I find are spotted via binoculars. Carry your binos at all times and don’t be afraid to glass up some bone. Ask anyone who has spent time in the woods with me about how fast I walk, and you’ll probably see them roll their eyes and start complaining. I’m just naturally a fast walker who is easily distracted, so I leave people in the dust all of the time. I also have to tell myself to slow down constantly when I’m shed hunting. The thing about good antler hunters is not that they are adept at spotting a bright white antler in a brown field but that their brain will register the slightest detail that’s out of place on the forest floor. This job, as you can probably guess, gets a lot easier when you’re going slower. Find your ideal shed pace, which will probably be slower than your natural gait.